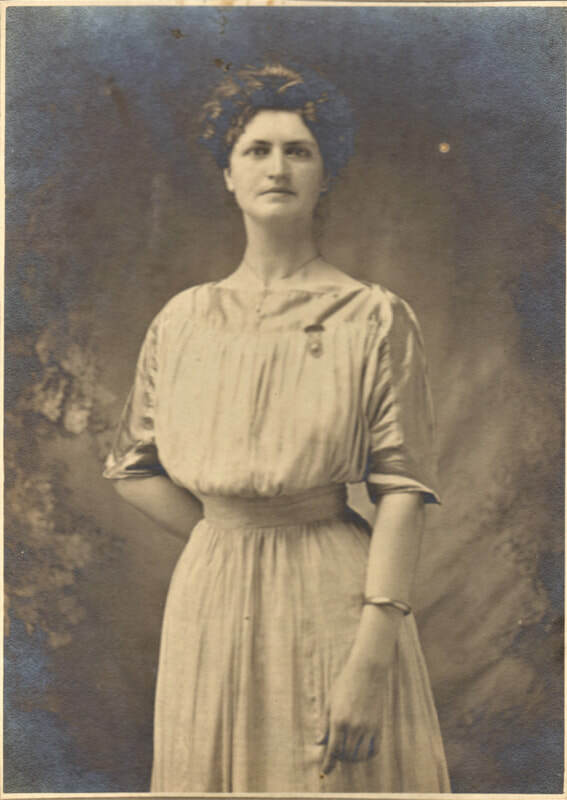 Originally from Braxton County, Lucinda Rose was accepted into the nursing program at St. Mary’s Hospital in Clarksburg and graduated in 1914. She worked as a nurse in the Shinnston area until April 1918 when she joined the 68th Unit, U. S. Army Nurses. After completing training at Camp Wadsworth in Spartanburg, S. C., Ms. Rose boarded a ship for the Front in September 1918. 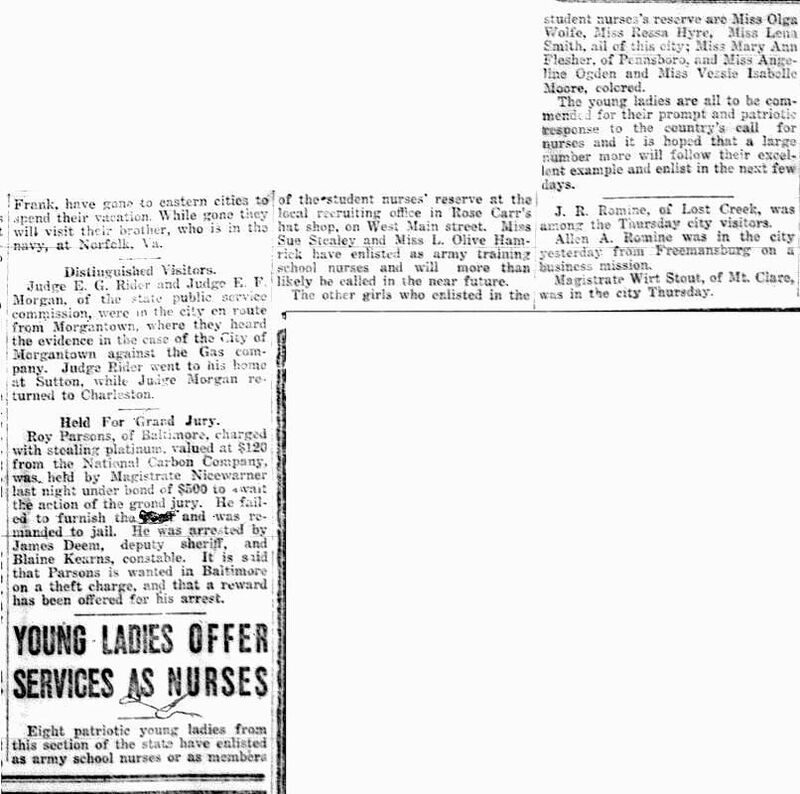 She unfortunately contracted the deadly Spanish influenza while tending to ill servicemen on board. Soon after arriving in Portsmouth, England, Lucinda Rose succumbed to the Spanish influenza. Ms. Rose was the only Harrison County woman to die in war service, and was one of American 161 women who died during World War I. The Ladies Auxiliary of the Veterans of Foreign Wars Post 573 in Clarksburg is in named in her honor. Lucinda Rose ca. 1916. Harrison County WV Historical Society Collection. Award given to the family of Lucinda Rose by the French Government after her death in World War I. Harrison County WV Historical Society Collection. 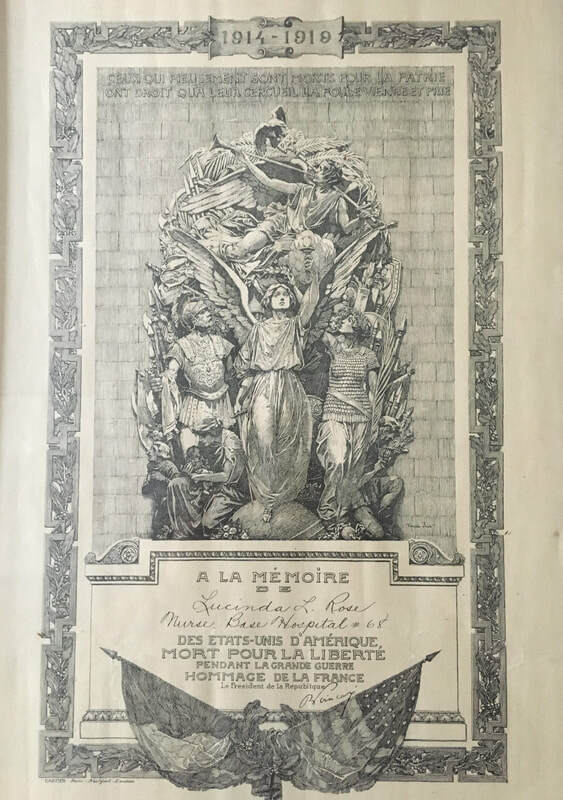 If you know any women who served as nurses or yeomanettes during World War I please contact the historical society at hcwvhs@gmail.com so we can honor their service. Other than their direct service, many local women took up the cause of fundraising for the war effort. They went about doing this fundraising in many different forms. There were different drives throughout the war including the famous national liberty bond drive. Local women's organizations also created their own local drives as well including the “Christmas Good Cheer Fund” to raise money for Christmas gifts for soldiers and holding carnivals to raise money for the Red Cross. To learn more about fundraising efforts click HERE. 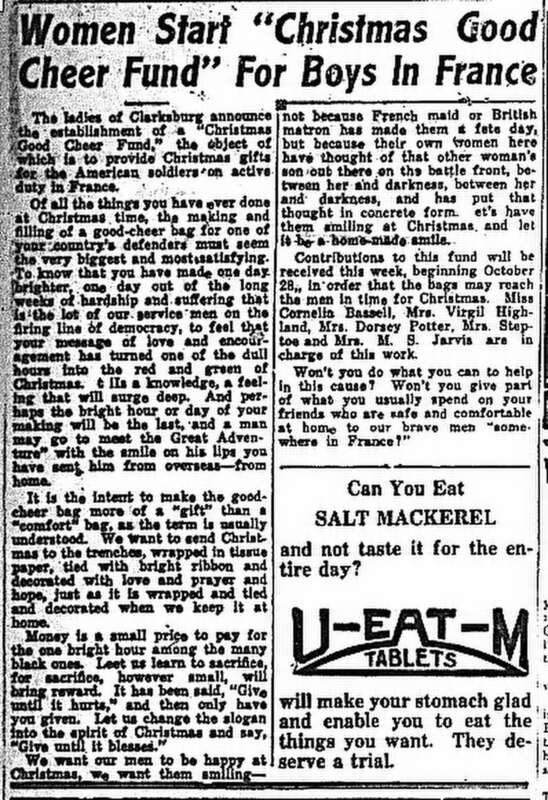 After the war the U.S. government paid for the cost of mothers and widows of soldiers to travel to Europe to visit the graves of their sons or husbands who died in battle and were buried there. Below is a list of some of those women and their decision on the pilgrimage. ​As provided by the Act of Congress of March 2, 1929, a report of the number of mothers and widows of the deceased servicemen now interred in the cemeteries of Europe who desire to make the pilgrimage to these cemeteries during the year 1930 or later, a list of their names and addresses, and the probable cost. Mrs. Sarah L. Burroughs—mother of Private Roy E. Burroughs (Battery B, 314th Field Artillery) who was buried at Meuse-Argonne American Cemetery; desires to do a pilgrimage later. Lived at 323 Liberty Avenue, Clarksburg. Mrs. Carmela Curia—mother of Private Tony Curia (Company M, 112th Infantry), of Logan County, who was buried at Meuse-Argonne American Cemetery; declines to take pilgrimage. Lived at 211 North 7th Street, Clarksburg. Mrs. Sallie Davis—mother of Private Russell F. Mash (Company B, 135th M. G. Bn) who was buried at St. Mihiel; declines to take pilgrimage. Lived in Clarksburg. Mrs. Sarah E. Duty—mother of Private Raleigh Duty (Battery A, 7th Field Artillery) who was buried at Meuse-Argonne American Cemetery; Undecided on taking a pilgrimage at time of report. Lived in West Milford. Mrs. Amanda Hildreth—mother of Private Dewey S. Hildreth (M. G. Company, 26th Infantry) who was buried at Meuse-Argonne American Cemetery; declines to take pilgrimage. Lived at 5 Morris Street, Salem. Mrs. Emma J. Jones--mother of Private First Class Earl Jones (Company F, 7th Infantry) who was buried at Oise-Aisne Cemetery; wants to do 1930 pilgrimage. Lived at 237 North Chestnut Street, Clarksburg. Mrs. Virginia McCann—mother of Corporal Mark McCann (Company C, 313th M. G. Bn) who was buried at Meuse-Argonne American Cemetery; Undecided on taking a pilgrimage at time of report. Lived in Clarksburg. One local born women contributed in a very international way. Mabel Gordon Dunlop, uncertainty, arrived in this world near Shinnston in 1881. Her mother died early in her childhood, and her father, Charles Dunlop, former general manager of the B & O Railroad station in Grafton, abandoned her. She was raised by neighbors and lived in a penniless condition until her father was located working for the railroad in Rock Island, Illinois. After Dunlop was forced to provide her an annuity, Mabel attended school in Wheeling and later studied archaeology and ethnology at the University of Chicago. It was when she studied abroad at the University Athens in 1901 that she met her future husband, Slavko Grouitch. Grouitch, a Serbian nobleman, and diplomat, already led a distinguished career in Serbian diplomacy and public service. The couple married on August 12, 1902. 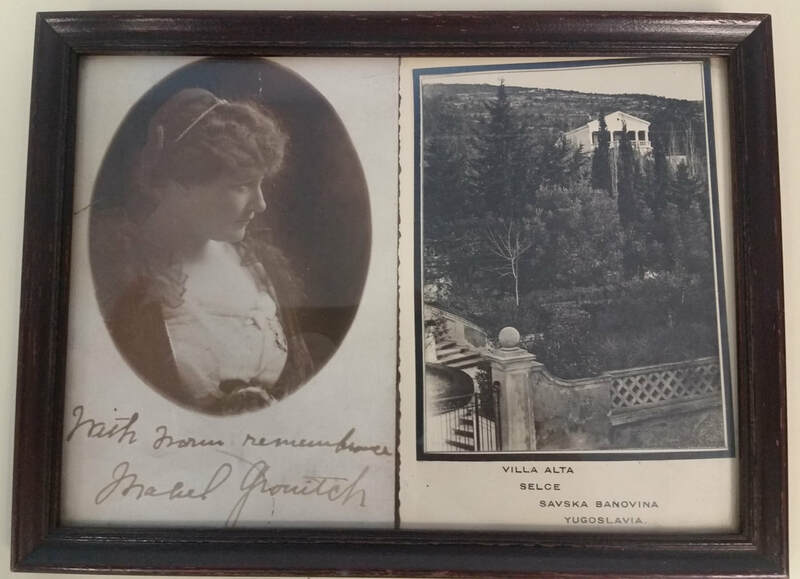 Mabel was immediately smitten with the Serbian people, and despite her baroness title, set out to uplift the lives of girls in her adopted country. She led efforts to establish a boarding house and school for 80 girls in Belgrade as well as develop an agricultural course of study for girls. When World War I erupted in Europe in 1914, she threw herself into service as an emissary and surgical nurse for the Serbian Red Cross. Mabel witnessed the horrors of the Balkan War in 1912 and took on a one-woman mission to alleviate the suffering of her citizens. As her husband served as a diplomat to Great Britain in 1914, she recruited 36 nurses to form a St. John Ambulance unit to work on the front in Serbia. Mabel’s war work went beyond just being a nurse as she later became a war relief fundraising force. In 1915, she and the American Red Cross raised more than $6,300 to fund the Mabel Grouitch Baby Hospital in Serbia which was led by two female doctors: Dr. Louise Taylor Jones and Dr. Catherine H. Travis. She created the Fund for Serbian Students which allowed young people affected by war to continue their higher education studies. Throughout the remainder of WWI, she assisted the American Red Cross in establishing hospital units in Serbia as well as made repeated visits to the U.S. to campaign for more medical supplies for those caring for the wounded soldiers as well as seeds, grain, farm implements and clothing for 800,000 Serbian refugees displaced by the fighting. Madame Grouitch single-handedly in 1917 raised over $91,000 which amounts to more than $1.5 million today. 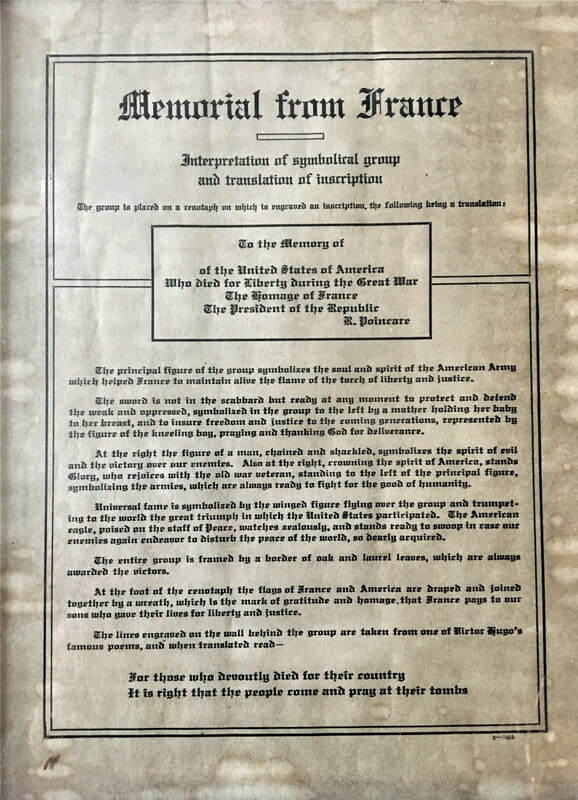 After the armistice was signed in November 1918, she became the director of the Serbian Aid Fund and continued to appeal to Americans for knitted garments for soldiers and civilians in Serbia. In the years immediately following the Great War, the Grouitchs’ took up residence in Washington, D. C. while Baron Grouitch served as the Serbian ambassador to the U.S. until 1922. After 1922, Madame Grouitch and her husband lived the remainder of their lives quietly at their estate in Serbia. Thanks to an postcard pictured above from the Historical Socities Collection, we do know that Madame Grouitch kept in touch with at least one local Harrison County citizen over the years: Emma Hume Hornor, wife of Congressman Lynn S. Hornor. Mabel Grouitch died of leukemia on August 13, 1956 at a Georgetown hospital in Washington, D.C., and is buried with her husband in Summerville, South Carolina.